In a small saucepan, bring balsamic vinegar and sugar to a boil. Reduce heat to low and let simmer until it's reduced by half and thickened. About 10 minutes or so. Remove from heat and set aside. Cook cubed chicken in a large skillet, over medium-hight heat. Cook and stir until chicken is thoroughly cooked. Season with salt, pepper and Italian seasoning. Meanwhile, preheat oven to 400 degrees F. Cut french bread in half lengthwise and place cut side up on a large baking sheet. In a bowl combine softened butter and garlic. Stir together then spread evenly over both French bread halves. 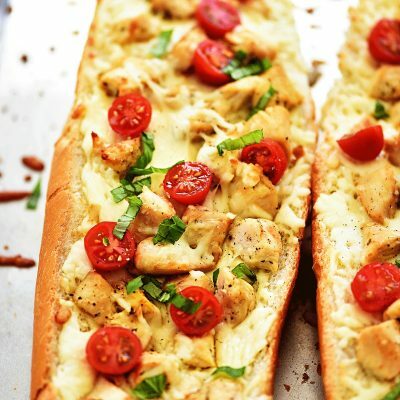 Then top each half with cooked chicken and Mozzarella cheese. Place sliced tomatoes all over the top. Place in oven and cook 15 to 20 minutes, or until cheese is melted and bubbly. Remove from oven and let stand 5 minutes before slicing. Serve with chopped fresh basil and drizzles of the balsamic reduction. Enjoy!